With the release of BackupAssist v7.3 a brand new method for restoring exchange mailbox data was introduced named ‘Exchange Granular Restore’. This is still a relatively new feature for many of our customers so I thought it would be useful to put together a guide to introduce this new feature and how best to make use of it. What’s the difference between the ‘Exchange Granular Restore’ (EGR) and the Mailbox add-on? With previous versions of BackupAssist to restore a user’s mailbox data a separate Exchange Mailbox backup job needed to be created. This additional backup job created a selection of PST files for each user’s mailbox. For this reason using this method required more space to store the backups and it took significantly longer to run. Older Exchange 2003 Servers are unfortunately not compatible with the EGR but if you have purchased a new EGR licence and are using an older Exchange 2003 server it’s worth noting that this method is still available in BackupAssist v7.3. If however you are using Exchange 2007 and above then we feel the new EGR console is a much simpler and powerful way to maintain a brick level backup of Exchange. So how do I create ‘Exchange Granular Restore’ compatible backups? Unlike the existing PST archive method you no longer need to create a specific backup job to be able to restore individual mailbox data. 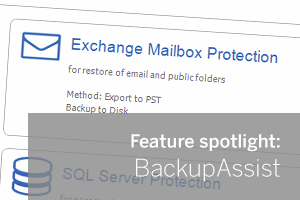 In fact any BackupAssist backup that contains the Exchange database files can be used by the EGR to find and restore mailbox data. By backing up Exchange in this way you will ensure that any changes made to the exchange database while the backup is running are only written to a shadow copy snapshot and are only committed after the backup has run. This maintains the consistency of the database file during backup and means that the EGR console can be easily used to mount the backup of the database at the point in time required and to drill down to restore the data. In the next part of this guide I will show you how to mount the Exchange database and find the missing data you need to restore.